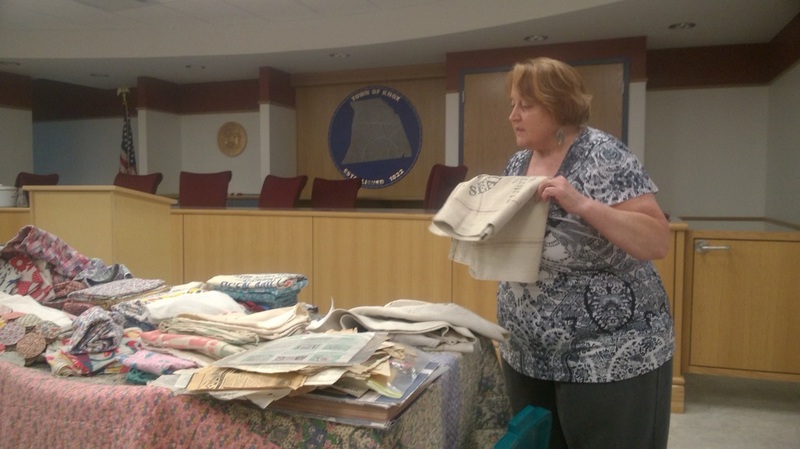 Kris Driessen, owner of the Quiltbug Quilt Shop in Guilderland, detailed the "History of Feedsacks" at our meeting. Staples such as corn, flour, and barley had traditionally been transported in barrels and boxes but the invention of the sewing machine in the mid-19th century with its sturdier hook and loop stitch made the use of plain cotton canvas sacks the norm. Because these sacks were tightly woven, items such as salt, sugar, and flour could now be shipped in these sacks. Called "chicken linen" these white sacks were re-used by thrifty housewives and re-purposed into underwear, handkerchiefs, diapers, and bibs. Manufacturers of the sacks realized the sacks were being re-used and began competing among themselves to make the prettiest colors and patterns. Pre-printed pillowcase designs, doll patterns, toy patterns, and "cheater quilt" patterns became popular. Military themes and nursery themes were also popular. Dresses, curtains, aprons, and tablecloths were made from the brightly colored sacks. After World War II technological innovations made the use of paper and plastic bags more economical and the use of cloth feedsacks died out. Kris credited the Bicentennial in 1976 with a resurgence of old crafts. Vintage feedsacks are valued now and, although in limited supply, once again are being used to make aprons and quilts. Here are some photos from Kris' presentation. Marie Viscio displays a quilt she made from feedsack triangles found in Ina Beebe's Jelly Bean Bag. Donna Gwin models a feedsack apron made by Jane McLean. Kris Driessen displays the wide variety of feedsacks in her collection. ​​Jim Spencer, owner of the Barent Lewis Stone House on Bozenkill Rd. Knox, NY, spoke at the KHS meeting. 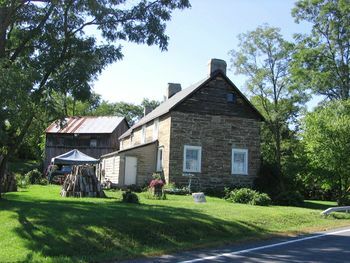 His house, possibly one of the oldest homes in Knox,is pictured above. Stone houses are unusual in the Hilltowns but were more commonly built in the Hudson River valley region. The original owners of the land came from the Hudson Valley area and this stone house shows strong Dutch influences in its design. There is a deed from 1731, but the deed does not specifically state that the deed is for this house. The barn consists of pieces of 3 barns that were moved from the Altamont area. Mr. Spencer has discovered candle-rubbings in the barn with names and faces etched on beams. This stone house was built as a tavern as well as a farmhouse. Possibly it was used as a military outpost during the Revolutionary War. Mr. Spencer hopes to do some metal-detecting to unearth some additional clues to determine its age.